Superintendent of Windham Public Schools Dr. Patricia Garcia has announced that Pedro Noguera, PhD, Distinguished Professor in Education in the Graduate School of Education and Information Sciences at the University of California at Los Angeles (UCLA) will be addressing students, teachers and the public in a visit to Windham High School and Eastern Connecticut State University (ECSU)on Tuesday, November 14, 2017. His visit to Windham will help celebrate the 10-Year Anniversary of the Center for Early Childhood Education (CECE) at ECSU, and to honor Windham Public Schools’ commitment to celebrating diversity. Dr. Noguera will lecture at the Fine Arts Instructional Center Concert Hall at ECSU from 9:00 to 10:00 AM. The lecture is free and open to the public. 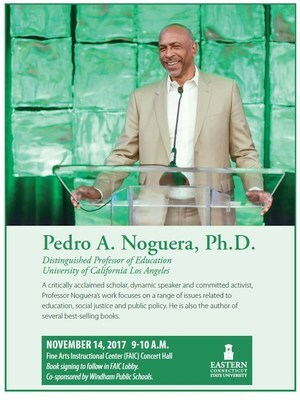 Professor Noguera is a critically acclaimed scholar, a dynamic speaker and a committed activist. He is a sociologist whose scholarship and research focuses on the ways in which schools are influenced by social and economic conditions as well as by demographic trends in local, regional and global context. His work focuses on a broad range of issues related to education, social justice and public policy. Dr. Noguera is the author of several best-selling books and more than 200 research articles on topics such as urban school reform, conditions that promote student achievement, and the role of education in community development. He also appears as a commentator on education issues for national news outlets including CNN, MSNBC and National Public Radio. In the afternoon, Dr. Noguera will tour Windham High School and meet with small groups of students and teachers.